The staff at Breitenfeldt Group guide you and your loved ones in Medicare and health insurance plans and options. They’re a health insurance brokerage committed to helping you gain confidence in your health insurance choices. 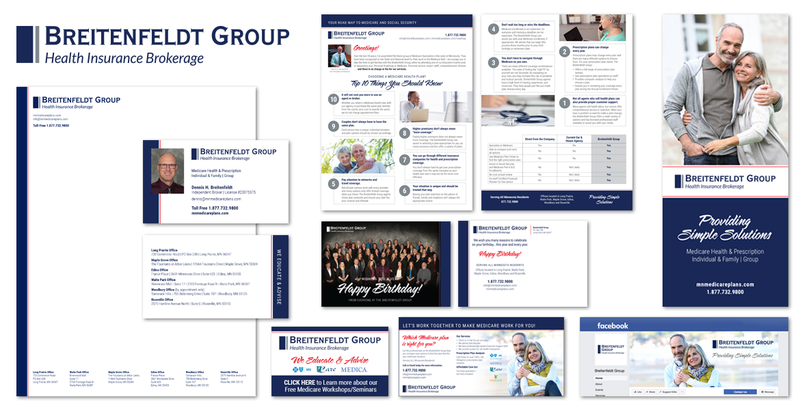 Breitenfeldt Group has experienced and knowledgeable staff available to help you make the right health insurance decisions for you and your family. When they were looking for experts in corporate branding, digital marketing, social media outreach, and point-of-sale materials, they turned to Blindspot-Advisors. We helped them create a website that reflects their mission and goal of genuine connection with and assistance to their customers. Breitenfeldt Insurance Brokerage is Minnesota’s leader in Medicare health plans, prescription drugs plans and health insurance for individuals and families. You will not find a more knowledgeable and helpful staff to answer your Medicare and health insurance questions anywhere else in Minnesota, and you won’t find a better website to point you in the right direction to get those questions answered. Blindspot-Advisors is your digital media marketing partner. From site design and development to affiliated social media accounts, to SEO support and site analytics, all the way to point-of-sales marketing materials, we can help you with marketing your entire brand and put your business in front of millions of potential clients every day. important human resource of all. Blindspot offers a full suite of digital agency strategies, capabilities and skills to help you create and manage your digital space.